For over 40 years, SAGA has led the way in music innovation and audience interaction. Throughout this time the band has released 21 studio-recorded CD’s under the umbrella of major record companies and has filmed over 20 music video’s which MTV had on heavy rotation. SAGA had the first ever digital live recording by a rock group, an enhanced and interactive CD ROM digital retrospective of their music catalogue, and an electronic concert ticket card with audio and visual elements for the fans to keep – all designed to engage people in new and exciting ways. Saga have sold over 10 million albums, and performed in over twenty countries to over fifteen million people. Their first album was released in 1978. The release was marked by a fortunate twist of fate – a leading Toronto record outlet exported a number of Canadian records to Germany. Within a few short weeks, the album had sold 50,000 copies as an import. With international feedback gaining momentum, SAGA returned to the studio in 1979 to record their second LP, Images at Twilight. The song “It’s Time” became the bands first single, and it climbed to top-10 on the Canadian music charts. The band had also mapped out the script for an eight-song science fiction story known as The Chapters. Many of the individual story parts would become some of Saga’s best-loved hits. After months of touring, SAGA released their ground-breaking Worlds Apart recording in 1981. The album entered the Billboard U.S. Top 10, and included 2 top-10 singles. The hit song “On The Loose” reached number 3 on the Billboard Hot 100 chart. That year, SAGA also received the Juno Award for Most Promising Group of the Year in Canada. Worlds Apart became a certified Gold album in the USA, selling 800,000 copies in 1983. SAGA’s achievements in the studio were equaled by their accomplishments on the road , with the band playing extensively around the USA, and sell-out tours in Europe, Canada, and South America. Several concerts were recorded for In Transit, the first digital live album by a rock band ever! The follow-up to Worlds Apart was Heads or Tales. It went to number 1 on the German charts, and was a top-5 album in other European territories. Heads or Tales produced 3 hits in North America, “Scratching the Surface,” “The Flyer,” and “Catwalk,” and sold as well as Worlds Apart. SAGA was the first Canadian rock group to perform behind the former Iron Curtain. The band also received the prestigious German Gold Ticket Award for being the year’s top selling concert act. Nineteen Eighty-Five saw the release of the Behavior album which also went No. 1 in Germany with great success in US and Canada. Wildest Dreams followed in 1987. The Beginners Guide to Throwing Shapes CD came out two years later, along with Saga’s contribution to the motion picture soundtrack Johnny B. Good. In April 1993, SAGA entered an extensive period of innovation and creativity. The band produced the energetic The Security of Illusion CD, and soon after that, provided music for the U.S. television series Cobra – a Stephen J. Cannell production. In 1994, SAGA issued Steel Umbrellas, a new studio album from those sessions. In 1995 Generation 13, the seventy-minute musical extravaganza was produced in Los Angeles; it took the band a year to complete and is Saga’s most critically acclaimed work to date. Canada’s music industry included the bands hit song “On the Loose” on the: Oh What A Feeling (A vital collection of Canadian music) collection, in 1996. In 1997, the Prime Minister of Canada, and the Premier of Ontario acknowledged the bands distinguished career in music. The band celebrated twenty years together with a new CD, Pleasure and Pain. And shortly after the long awaited second live album Detours followed in 1998. The new millennium saw SAGA return to the distinctive sound of their earlier hits with the albums: Full Circle, House of Cards, Marathon and Network. DVD releases: Silhouette, All Areas, and Marathon World Tour 2004 – The Official Bootleg provided fans with a visual experience to compliment the bands extensive music catalogue. Beginning in 2005, SAGA issued several multi-media projects, including: The Chapters Live CD, a studio album called Trust, and the Worlds Apart Live in Concert DVD. SAGA didn’t stop there. In 2007, the band released 10,000 Days, and a few years later another new recording called The Human Condition. A concert DVD Contact: Live in Munich was also made. In 2011, Heads or Tales Live was issued. SAGA had great chart success in 2012 with their 20/20 CD, in 2013, SAGA released the Bluray concert disc: Spin It Again – Live in Munich. Another new chapter was written with the June 27th/14 release of Sagacity – the brand new studio recording on earMUSIC Edel. The album is available as a standard edition, a special edition with a bonus lives CD, on vinyl, and digital download. On June 13, 2017, SAGA celebrated their 40 year anniversary by embarking on their “Final Chapter Tour” which saw the band performing multiple sold-out shows as they said their farewells to the fans in Europe and North America. The band had been on a rigorous touring schedule for some years, and this announcement came as co-founder Jim Crichton opted to step away and recharge. Jim is currently represented on bass by Dusty Chesterfield. Although the Band has since adopted a more relaxed schedule, they are ironically, more in demand than ever. To their slight chagrin, the concept of leisure has been less likely every year since. 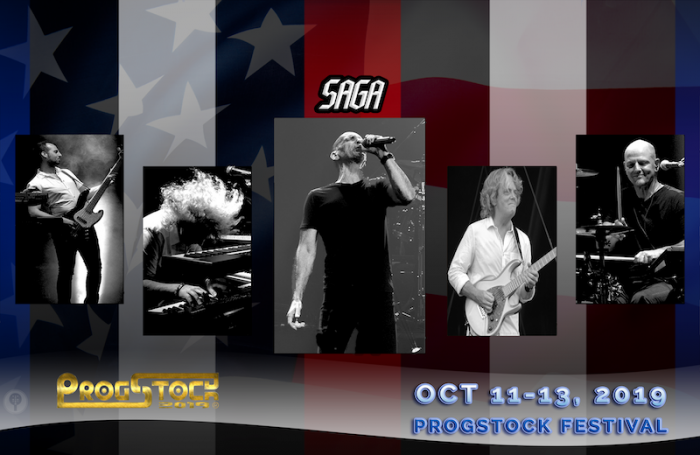 And now, it has been officially announced that Saga will join ProgStock 2019 as our Sunday night headliner on Sunday, October 13, 2019!